Tourism is all about sights and experiences. Our work for VisitBlackpool involved creating a website that translates the many sights and experiences Blackpool offers its millions of visitors into an equally impressive online destination befitting its status as the UK’s top seaside resort. VisitBlackpool is Blackpool Council’s tourism arm and has a mission to showcase the UK’s most popular holiday destination to a worldwide audience. Its website, VisitBlackpool.com, is a key tool in furthering that mission and increasing the resort’s 18 million visits per year. We won a competitive tender to design and develop a new website for VisitBlackpool. The overarching aim of the new site was to maintain Blackpool’s status as the UK’s most visited seaside resort in an increasingly aspirational family holiday market. We were tasked with repositioning Blackpool as a contemporary, family beach resort; showcasing the breadth and quality of Blackpool’s year-round attractions, events and entertainment; and building upon the significant investment in regeneration and destination marketing that has been made in recent years. We designed and developed VisitBlackpool.com to align closely with VisitBlackpool’s existing brand to ensure it complemented the destination marketing work previously undertaken, which was already generating interest and resulting in an upsurge in visitor numbers. We developed the site on the Kentico Content Management System (CMS). As content presentation was key to the success of the new site, we worked with the VisitBlackpool team to deconstruct the previous site’s Information Architecture (IA) and create a new, user-centric IA that met the needs of their users and accommodated user journey improvement. We took the very easy decision to make Blackpool’s attractions the stars of the show. Some of VisitBlackpool’s core values focus on the ‘wow’ factor provided by its attractions - both internationally-renowned landmarks and hidden gems - and the unique and surprising nature of the resort, so it made sense to put its key sights at the forefront of the new website. To do that we designed a site that is dominated by VisitBlackpool’s strong photographic assets. This helps to showcase the array of attractions, such as the Blackpool Tower, the Winter Gardens and the Comedy Carpet, while also demonstrating the investment and regeneration from which the destination has benefited. We created a two-tier navigation system, simplifying the site’s primary navigation and signposting three distinct categories which reflect individual stages of holiday planning phases; ‘things to do’, Accommodation and Plan your trip. The snapshots of Blackpool’s many highlights draw on the resort’s seaside postcard heritage and bring that tradition into a contemporary setting and styling. The site is integrated with VisitBlackpool’s internal marketing system so that up-to-date information about accommodation and attractions is available to holidaymakers when they are browsing VisitBlackpool.com. VisitBlackpool now has an eye-catching and engaging website that gives people a visual account of the many reasons why they and their family should visit Blackpool. During high season (April – November) the site delivered 9% increase in online transactions which equated to a 13% increase in revenue and 5% increase in average order value. These are excellent results for the VisitBlackpool Team, demonstrating the new site’s ability to deliver tangible commercial results. 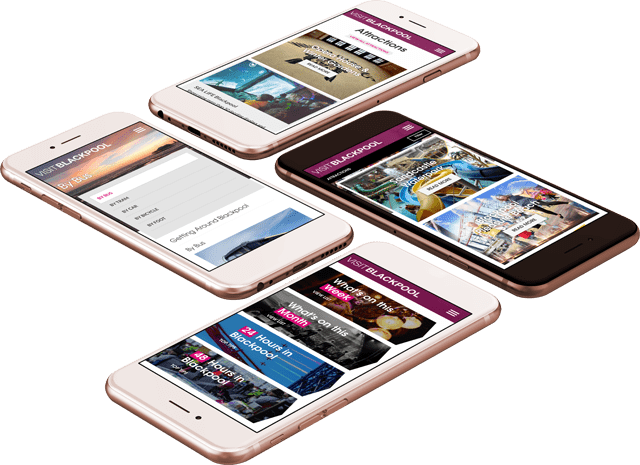 The new VisitBlackpool site won ‘Best Online Experience’ at the 2019 DANI Awards, in a highly competitive category; the site was commended for its ease of use and navigation, pleasing aesthetics and engaging content.